This economic analysis was written by Dr. Jeffrey Michael with the University of the Pacific Eberhardt School of Business. He writes, "The issue of a peripheral canal has returned to the center of the debate about the future of the Delta. The case for building a peripheral canal has recently received a major boost from a report by the Public Policy Institute of California (PPIC) that endorses the peripheral canal as the best long-run solution for the Delta. The PPIC report considers alternative strategies, most notably ending Delta water exports. They find that ending Delta water exports is significantly better for the environment than a peripheral canal, but reject the strategy because it is too costly. However, the PPIC’s cost estimates are exaggerated. They depend on inaccurate assumptions that utilize outdated, undocumented, or fabricated sources. 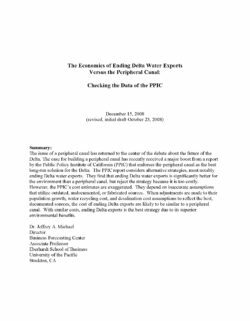 When adjustments are made to their population growth, water recycling cost, and desalination cost assumptions to reflect the best, documented sources, the cost of ending Delta exports are likely to be similar to a peripheral canal. With similar costs, ending Delta exports is the best strategy due to its superior environmental benefits." WATER FACILITIES INCLUDING A PERIPHERAL CANAL. REFERENDUM STATUTE. Summary of Legislative Analyst's estimate of net state and local government fiscal impact : As Project has been planned and operated to be self-supporting, implementation under present policies would not require increase in state taxes or reduce funds for other state programs . 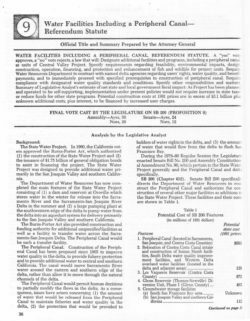 Potential construction costs at 1981 prices are in excess of $3 .1 billion plus unknown additional costs, plus interest, to be financed by increased user charges.